The Federal Reserve has cut US interest rates sharply in an attempt to restore confidence to nervous financial markets and boost the ailing economy. The central bank lowered rates to 2.25% from 3%, but the cut was smaller than financial markets had expected. Many economists believe the US economy is already in a recession. The Fed has taken strong action this week to avert a financial panic after investment bank Bear Stearns was forced into a fire sale to avoid collapse. US Treasury Secretary Henry Paulson admitted earlier on Tuesday that the economy was facing a "sharp decline" at the moment, but hoped for a recovery later in the year. The Fed has now lowered rates six times since mid-September, with the economy reeling from the credit crisis that was triggered by a slump in the US housing market. "Today's policy action, combined with those taken earlier, including measures to foster market liquidity, should help to promote moderate growth over time and to mitigate the risks to economic activity," the Federal Reserve said. US shares initially trimmed gains after the Fed's announcement but the benchmark Dow Jones industrial average later resumed its ascent. Wall Street rallied earlier after two leading investment banks, Goldman Sachs and Lehman Brothers, reported smaller falls in profits than analysts had been expecting. The dollar, which has been hitting record lows against the euro, gained ground. The Fed is hoping its actions will stave off both a recession in the wider economy and go some way to ease unprecedented conditions in the financial system. "The Fed's action is yet another forceful move in its attempts to alleviate the liquidity crunch and to shore up a rapidly weakening economy," said Arun Raha, senior economist at Swiss Re. As the economy worsens, banks and financial institutions are calling in loans and becoming increasingly reluctant to lend money, particularly to borrowers considered to be high risk. "There can be no health in the economy until the banking system is working properly," said K Daniel Libby at Sands Brother Select Access Fund. The Fed expressed some concern about inflation in the statement that accompanied the interest decision. Analysts said this could signal that an end to the current cycle of rate cut cycle was fast approaching. "The economy is in, or close to, a recession, but increasing oil prices have kept inflationary pressures from abating, complicating the Fed's task," said Mr Raha. US producer prices, released on Tuesday, rose by 0.3% in February compared to the month before, but a key measure of producer core inflation rose by 0.5%, the fastest pace in well over a year. There were also signs of opposition inside the Fed to the aggressive moves. 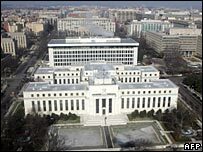 Two members of the central bank's rate-setting Federal Open Market Committee voted for a smaller cut in rates. "By cutting 75 points rather than 100 points, the Fed sought to restore leadership over the market and indicate that its actions would not be entirely dictated by market expectations," the Bank of New York said.